How one industrious Lithuanian immigrant transformed the nation’s Seders. When Passover begins at sundown April 14, Seder plates will be prepared with maror and chazeret, charoset, karpas, zeroa, and beitzah—bitter herbs, a fruit-and-nut paste, parsley, a lamb bone, and a boiled egg. On a separate plate will be three pieces of matzo, probably the only one of the ancient foodstuffs recognizable by non-Jews. The unleavened cracker symbolizes the swiftness with which Jews fled Egypt: There was not even time for their bread to rise. 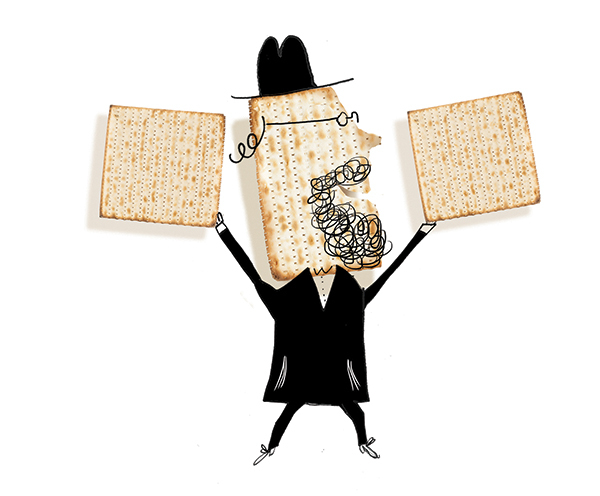 Matzo may seem like a simple cracker but it’s complicated by the dictates of kosher law. Among other rules, matzo dough must not be allowed to sit, lest it rise. So the entire process, from mixing through baking, has to take place within 18 minutes. Before the 19th century, matzo was made in synagogues with ovens built specifically for that purpose; after the mid-19th century, independent bakers took over the business, and machines were developed to make the preparation more efficient. But some Jews felt the new methods were not in line with kosher law. So for many of the faithful, proper matzo remained a local luxury only the wealthy could afford. That changed a century ago, when Rabbi Dov Behr Manischewitz started baking matzo in Cincinnati. The Lithuanian immigrant’s drive led him to invent and patent a baking machine that created a matzo empire. Manischewitz matzo, cut and baked in uniform squares and packaged in shippable boxes, helped transform matzo into an essential staple for the common Jew. Like Ivory soap, pro baseball, and the Filet-O-Fish sandwich, it became an icon of Cincinnati ingenuity—though these days little remains of the family’s legacy in the city where it was created. Family lore has it that Behr Manischewitz came to the Queen City in 1885 with his wife, Nesha, and their three small children to serve as a kosher butcher for a group of Orthodox Jews from his hometown in Lithuania who had already settled here. By the late 1800s, Cincinnati was already the center of Reform Judaism and home to a large number of German Jews. But the last quarter of the century saw an influx of immigrants like Behr and his wife—poor Eastern Europeans Jews who tended to be more conservative and less intent on assimilation. They spoke Yiddish and established their own synagogues, schools, and social clubs in their new home. Indeed, within two years of his arrival, Behr helped start the Cincinnati Talmud Torah Society, an Orthodox school for poor Jewish children. The family (which eventually grew to include eight children) settled in the tenement-crammed West End, the center of the local Jewish community at the time, and Behr set about providing services that his community needed. As a shochet, or ritual slaughterer, he would have been responsible for preparing cattle and sheep for consumption. He wrote to his parents in Lithuania in April 1887 that he and Nesha “spent Pesach very pleasantly, even though, with my small children, it was hard to do without chametz.” Chametz refers to any foods made with leavened grains that are forbidden during Passover. Behr saw an opportunity in this, and the next year he started baking matzo. “For all of his orthodoxy, [Behr] was very interested in innovation,” says Jonathan D. Sarna, a professor of American Jewish history at Brandeis University. That spirit is evident in the patent Behr filed in 1911 for a long oven with heating elements both above and below a conveyor belt—a technical improvement ensuring that the matzo was finished within the proscribed 18-minute time limit. Sarna, who taught at Hebrew Union College in the 1980s and coauthored the historical account The Jews of Cincinnati, explained in a 2005 research paper titled “How Matzah Became Square” that this machine helped the Manischewitz bakery produce more, better, and cheaper matzo than ever before. The company’s square matzo crackers were considered top quality and were marketed as a luxury item. Early packaging reflected this: Manischewitz matzos came in a wooden box. Being able to ship the mass-produced matzo nationally (and later, internationally) helped fuel the success of the business.Behr’s growing prosperity enabled him to send two of his sons, Max and Hirsh, to Palestine for their educations. It also enabled him to expand; in 1913, he opened a large factory at 2100 West Eighth Street in Lower Price Hill, greatly adding to the capacity he had with his original factory on West Sixth Street. And in 1913, the family’s fortunes were such that Behr and Nesha were able to move from the West End to posh Walnut Hills. Their enjoyment of the new home was short-lived, however; Behr died in 1914 in his mid-50s. Upon his death, Behr’s will stipulated that his five sons should take over the company, with the condition that his unmarried son Meyer wed an Orthodox woman in order to receive his full share. (His two unmarried daughters were each to receive $12,000 upon their marriage to Orthodox men.) One-tenth of company profits were to be devoted to charity—60 percent to Palestine, and 40 percent to local charities. By the 1920s, the Manischewitzes moved to the upscale bedroom community of Avondale, where they were major figures in their congregations and in charity organizations. Under the sons’ tutelage, the B. Manischewitz Co. continued to expand. Jacob Manischewitz, who later took over the company, clearly inherited his father’s bent for innovation; there are dozens of patents in his name. Marketing became a much bigger component of the matzo business as well. The text-heavy ads of the early days were supplanted with intricate images that conveyed the kosherness of the product. Cincinnati had been a good place to begin, but East Coast customers began to dominate the company’s sales. The brothers opened a bakery in New Jersey in 1932 and moved their headquarters there in the 1950s. The New Yorker wrote in 1933 that the Manischewitzes’ matzo company was the largest in the world; one machine at the New Jersey factory turned out five miles of matzo in a single day. The new plant helped fill orders in the New York market, which consumed half of the company’s total annual matzo output. And one by one, Behr’s families relocated to the New York area, with the exception of Howard Manischewitz, Jacob’s son, who oversaw the Lower Price Hill factory until its closing in 1958. The B. Manischewitz Co. is no longer in the family—Kohlberg & Co. bought it for $42.5 million in 1990. At the time, it controlled 80 percent of the matzo market in the United States. Bernard, the last grandson to run the company, died in 2003. The main Manischewitz plant remains in New Jersey; a new plant opened in Newark to much acclaim in 2011. Alpern lives in Switzerland now, and the rest of her great-grandparents’ descendants are similarly dispersed. Few carry on the name Manischewitz. Some are still strictly Orthodox; some are no longer observant Jews. Many of the buildings in which the family resided in Cincinnati are long gone. What was once the largest matzo factory in the world still stands in Lower Price Hill, although it hasn’t been a bakery for years. But some of the Manischewitz entrepreneurial spirit seems to linger: The building has been parceled out to tenants of various trades—a carpenter, some artists, and a company that grows microgreens. Originally published in the April 2014 issue.